Musings of an Aging Boomer: Where Will All The Old Folks Go? 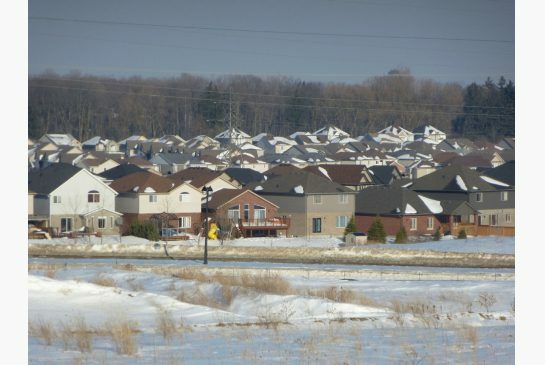 'The greenfield development industry likes to perpetuate the notion that Canada has a wealth of land, because of course they want to justify building more subdivisions. But in reality, Canada is not land-rich in terms of land that we can grow food on -- and this land happens to be the same land that is in close proximity to cities (and this is what makes that land attractive to urban-sprawl developers, so they buy it on speculation). And, Waterloo's farmland, like that of the Toronto area, is indeed excellent farmland - land which we cannot afford to lose. So, urban economist Peter Norman is dead-wrong when he says "Canada is land-rich and it's part of our culture", because even though our gross land area is huge, the vast majority of our gross land is effectively undevelopable (in particular our vast northern areas). And, that's why our population is so heavily crowded along our southern fridge -- and most of that is concentrated in the Windsor-to-Québec-City corridor (so, including Waterloo Region, Toronto-Hamilton-Niagara, and so on). And, this corridor happens to be where most of Canada's prime farmland is located. So, we cannot afford to let the developers use this prime farmland as a speculative investment and make big bucks off suburban-izing the farmland that current and future generations will need to grow food on. Firstly, we are starting to see (on a huge scale) that agriculture that depends on chemicals (pesticides) and genetic tampering (GMO) is unsustainable. We can expect that, in the near future, we will need a less-technology-dependent form of large-scale agriculture, and this will mean more land is needed because the per-acre yield will have to be decreased in order to ensure long-term sustainability. Thirdly, transportation costs will eventually become too high to enable the import of food from far away (Mexico or California), and so we will need to plan to grow more food locally. Burning huge volumes of fossil fuels to fly and truck food long distances cannot be done forever. Fourthly, anthropogenic global warming (climate change) means that arable land distribution will change. For example, southern California is in the midst of a huge drought, which is affecting food production. Meanwhile, we have great farmland in an area that is not prone to large-scale drought problems, so it is plausible that in the future, we might find ourselves exporting fruit and vegetables to California. So we have another incentive to preserve as much farmland as possible. On top of all this, we cannot forget the many hidden environmental costs of car-dependent urban sprawl. Roads slash through natural areas, destroying wetlands and making habitats unsuitable for forest-interior species. Cars demand expensive roads (expensive to build, expensive to maintain), which are then treated with road salt that in turn contaminates our groundwater and rivers. Entire books have been written about the widespread, pervasive harm of car-dependent sprawl. And, cars (each carrying just a single person) depend on carbon-spewing fossil fuels and other finite resources -- and this is not just the fuel burned by each car, but the entire behind-the-scenes manufacturing chain that supports the car-dependent lifestyle (everything from oil extraction, including Alberta tar-sands messes, to the manufacturing of parts and consumables, and also end-of-life disposal) and also the human-health impacts (asthma from air pollution, disabling long-term injuries from accidents, plus obesity and so on). Although developers cleverly argue that each subdivision only consumes a small amount of land, they conveniently gloss over the cumulative impact of whittling away at our farmland and natural areas. And, while they like to show that they don't put houses in designated natural areas, they cunningly place houses immediately adjacent to them, thereby inducing the new suburbanites to invade and effectively extend their backyards into those natural areas. The slick marketing of new suburbs always promotes the proximity to natural areas, while conveniently glossing over the permanent degradation of those natural areas by car-dependent sprawl. Given how Canada's population is crowded into southern-fringe cities (as I noted earlier), our city-hosting portions (such as southern Ontario) actually have a population density (and also climate) similar to many European nations. So, why have we become so addicted to cars? Our prevalent culture of car dependency is not a result of geography, but rather a result of marketing, both by the auto industry (in particular General Motors which, early in the 20th century, bought out urban tramways in order to shut them down) and the greenfield development industry. This has been taking place over the past decades, and has been particularly prevalent since the Second World War. So, developers cleverly argue that they are responding to market demands, but they played a very big role in creating those demands. These devastating hidden costs are not included in the artificially low sticker prices of houses in car-dependent sprawling subdivisions, because these costs are being offloaded onto future generations (so, our grandchildren, collectively) and the natural environmental at large (i.e. all the millions of species that we are supposed to be sharing this planet with). Basically, this all boils down to inter-generational and inter-species fairness. Some of the costs of suburban car dependency are also being paid for by society at large, in particular the people who drive little or not at all. Included in this group are people who plan their lives (e.g. intelligent choice of place to live) so that they can get generally around on foot, by bicycle, or public transit. Because non-car-dependent people are paying property taxes and income taxes too, they are effectively subsidizing the car-dependent suburbanites. Given all the many long-term realities and problems of suburban sprawl, it should be clear that a long-term view is needed. The democratically elected Region of Waterloo has demonstrated long-term vision, and the Region recognizes that democracy entails listening to both current and future generations. The Region is expert at seeing the big picture, and implementing a hard urban boundary (Countryside Line) is a key part of this. The Region has already made it clear, long ago, that speculation is not a valid land use. The Region also made it clear that because land is a finite resource, therefore the only logical way to accommodate population growth is to grow upwards instead of outwards. The debate above, along with the observations in the newspaper article that prompted it, highlight considerations that most smaller and rural municipalities in Canada rarely tackle - their councils' tendency to let developers drive the housing stock portfolio in their community. Given the opportunity, local builders will construct whatever is the best compromise between highest attainable price for saleable inventory, their relative expertise in building styles, and the anticipated time to full transfer of title (involving municipal planning approval efficiency and willingness to buy among the target demographic). Local government can influence the process in many ways, but their approach is too often reactive and lacking in the kind of data gathering and analysis that Waterloo Region is profiled as engaging in. 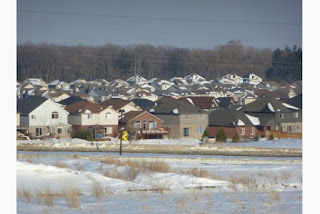 Small municipalities closer in to Toronto than those in Waterloo Region, those in the outskirts of the Greater Toronto Area, are under great development pressure that is a doctrinaire product of an interventionist provincial government's Places To Grow requirement where the Province, not local government, sets the mix and density targets. Citizen involvement is hobbled by the big stick of provincial ideology. Macro planning and development is the order of the day. Low-density mixed landscapes-and-village municipalities are smothered by the large-scale design experience and top-down imperatives of highly paid career civic planners who have spent their formative years facilitating conventional built development and interacting with its developer advocates and beneficiaries.